There are six good places to eat in Volcano Village (and some average, see below). All restaurants are locally owned, and you will (luckily) find no big chain restaurants here. Food is a bit more expensive here compared to other places on the Big Island, but the quality of the food is good and the locals friendly. Considering the alternative of a long drive to Hilo and the great scenery, we heartily recommend dining in Volcano. Volcano Village (right) and part of Hawaii Volcanoes National Park (left). Expect to find local “mom-and-pop” restaurants in a Jurassic park like setting. Image adapted from source. If you want to see where in Volcano these restaurants are you can have a look at our interactive map of Volcano Village. We use this page to list our favorite places to eat in Volcano. Please note that the list is not ordered, and that we count all these restaurants among our favorites! Opening hours: Monday, Tuesday, Thursday, Friday, Saturday and Sunday: 12:00PM-9:00PM, last Seating At 8:30PM. This is your most up-scale option in volcano. The restaurant gets very good reviews and offers good quality food, but the menus are not that large so if you are a big eater, this might not be he place for you. They also offer a special Sunday brunch between 10:00AM and 2:00PM. Opening hours: Monday – Sunday 7:30AM – 10:00AM (breakfast), 10:00AM – 2:00PM (lunch), >5PM (dinner). This is a small mom/pop place in Volcano Village. Outdoor seating only, covered and uncovered on the asphalt. Fresh and tasty sandwiches and soups, large portions for cheap. 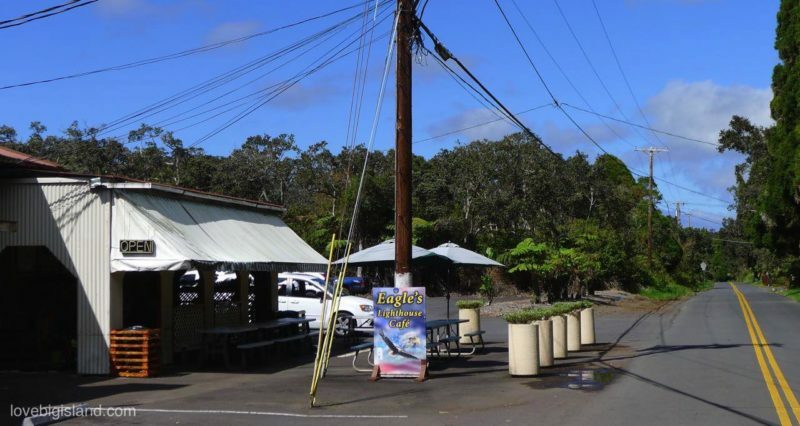 They open early, and are a good choice for a quick breakfast on your way to the Hawaii Volcanoes National Park. They are also a good place to pick up a sandwich if you are spending the day in the Park (take-out orders welcome). Opening hours: 6:00 am – 7:00 pm 7 days/week. Eagle’s lighthouse cafe is easy to miss if you don’t know what you are looking for. They have fantastic sandwiches to bring for lunch in the Hawaii Volcanoes National Park! Café Ono is located in Volcano Garden Arts in Volcano Village and is only opened for lunch.They serve locally produced, vegetarian organic dishes such as soups, salads and sandwiches. Good food for decent prizes. Volcano Village now has it’s own food truck! The chef gets as many of the ingredients as possible from local farms and farmers markets. This food truck has recently (early 2015) been voted “best Thai cuisine on the Big Island” on Tripadvisor. Obviously, take-out orders are available. Opening hours: Tuesday to Saturday between 11:00 am and 6:00 pm (Sunday and Monday closed). ‘Ohelo cafe is the bet ‘fine dining’ options in Volcano Village. They work with fresh, local ingredients and offer hand made cocktails, local craft beers on tap, and an extensive wine list. Their cuisine can be described as “Hawaiian Italian”, and if you are interested in the details of their cooking you can see if their Chefs Table is available! This is a popular restaurant, so we recommend to call ahead for a reservation. There are a few more options for breakfast/lunch/dinner in Volcano Village, but they don’t get as good press as the places listed above. Big O’s: Inside the Kilauea General Store at 19-3972 Old Volcano Rd. You can get Pizza and sandwiches here. Pizza takes about 30 minutes. Kiawe kitchen has closed their doors in Volcano Village as of September 2012.